All alone, deep into the concentration of his solitary experience, and really enjoying himself. It made me happy to see the gusto with which he devoured the bowl of mussels. 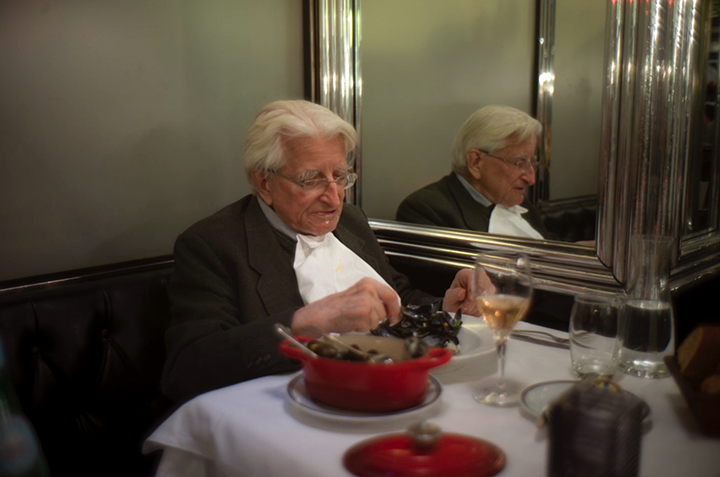 This entry was posted in Uncategorized and tagged dining, France, Interior, Mussels, portrait, restaurant, solitary on January 18, 2015 by joelmeyerowitz2014. I have felt portrayed myself in this picture. When I´m on assignment I usually travel alone and work hard. Lunch and dinner are very important moments for me. I like good food, no matter it´s cooked by a Michelin three starred cooker or a honest owner of a humble secondary road inn. When I want to really enjoy a meal, I need concentration, so I go alone to the restaurant. In many places of Europe going alone to a restaurant has the advantage that a lone commensal can be confused with an inspector of a restaurant guide and the dining experience can be a bit better.